Hello there! Thanks for stopping by, we just wanted to let you know that we are really pleased your investigating our site for your fitness journey (and if your already with us Hello to you too!). You are welcome to our sessions no matter your age, creed, gender, religion, shape, or size - we are open to everyone. Wolanski's Aerial and Pole Fitness Dance sessions are designed to allow participants to work at their own pace and cater for all; from complete beginners to long-term practitioners in the performing arts sector. Classes are tailored to suit individual needs, so if you have a physical goal or have any queries just let us know. We will be happy to discuss and plan the session with your requirements in mind. Classes improve all aspects of fitness including co-ordination, mental stimulation, improved blood circulation, flexibility, balance/motor skills, muscle endurance, definition, and strength. Time spent hanging upside down, spinning and stretching will also give you a confidence boost as you learn and perform a variety of different skills. The people here have lots of fun doing what they love and encourage much laughter amongst participants in the sessions - which we are sure you already know - releases lots of happy hormones, energising and lifting moods. This is exercise without feeling like exercise! Good for the body and good for the soul! With more than 15 years' teaching experience and a vast list of qualifications in anatomy, sports and aerial, Wolanski's Pole & Aerial Fitness is an award-winning business with an all in-house trained team. To very nearly quote the lyrics of the great Frank Sinatra (cue the tune...): "Come fly with us, we'll fly, we'll fly away"
We are available for performance hire and (pending on the intricacies) rigging. 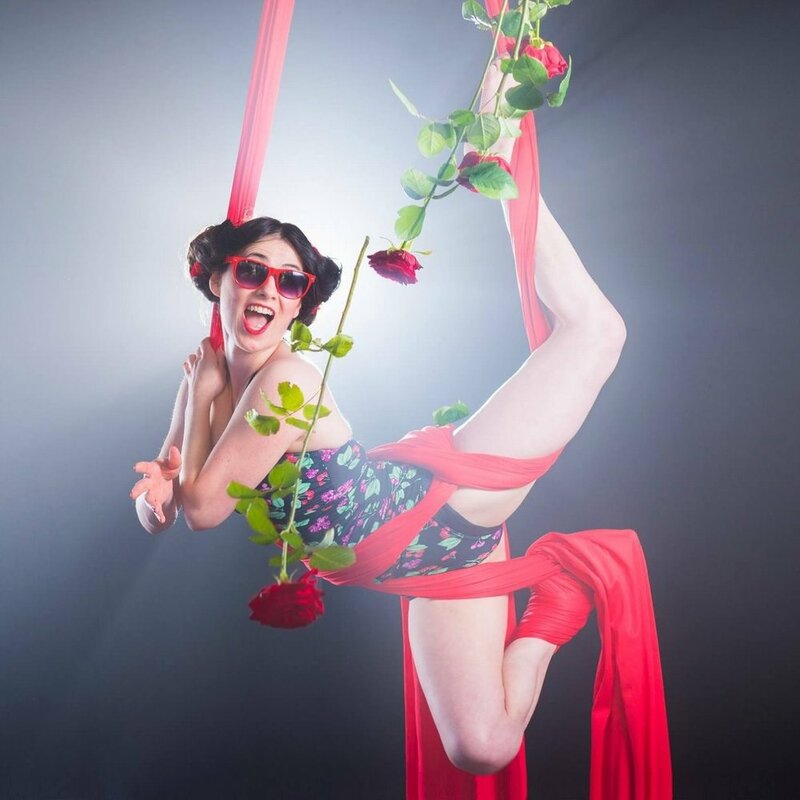 Providing bespoke entertainment on a variety of circus apparatus: Trapeze, Pole, Floating Pole, Aerial Hoop, Aerial Fabrics, Aerial Hammock, Aerial Net...well you get the picture. Basically anything that you can imagine we can hang from. We cover festivals, theatre venues, weddings and lots more. A few of our most recent performances include the Belladrum Tartan Heart Festival, Edinburgh Fringe - Russian Roulette Show and Midstock festival. Simply fill out our Contact Us form with some details of the event and if you have a preference for equipment or a theme in mind. We can always suggest some options if you are unsure. We regularly have opportunities for our participants to perform at private and public events and encourage participation in a variety of fun projects throughout the year. Examples of these include: Edinburgh Fringe Festival, our annual calendar shoot, awards ball and in-house productions. Wolanski's Pole & Aerial Fitness has the support of Youth Business Scotland, Sight & Sound Scotland, Business Gateway, Stirling University's Business and Enterprise programme and Healthworks Clinic. Keep up to date with events and class information.